I am an "every man." So is my Dad, my brother, my uncle and my father-in-law. 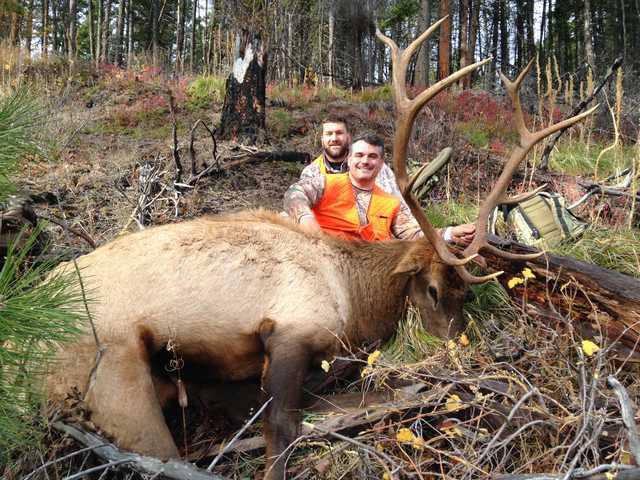 Growing up in Western Pennsylvania we dreamed of one day hunting bull elk in the high mountains of the west, but for years it was just that--a dream. For many reasons we never followed through on those dreams, money, time, kids and just not knowing where to start. But in 2011 I made the decision that we WOULD go while I was still young and before it was too late for my dad. We could not afford a high priced trip, but I believed we could make it happen. This was a long range plan. We needed time to plan (Which state? Guided or DIY? Public or Private? Which outfitter? 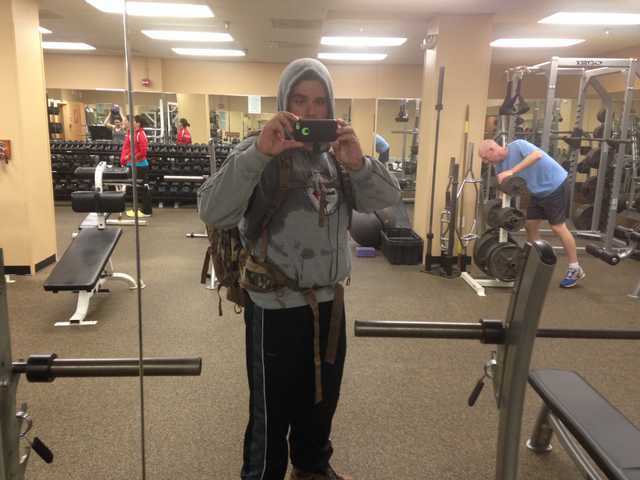 ), time to save (Guide, travel, equipment, etc), and time to get in shape. 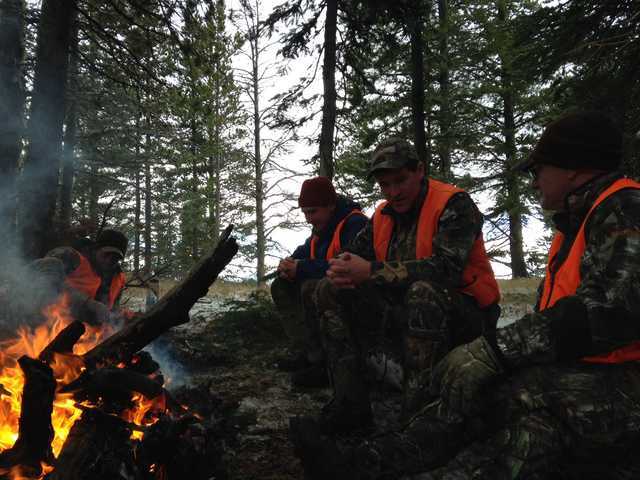 After countless hours of of internet research, phone calls to outfitters, interviews with past clients and huddled conversations with family, I booked a hunt for the first week of the 2014 rifle season in Montana with Montana OutWest Outfitters. 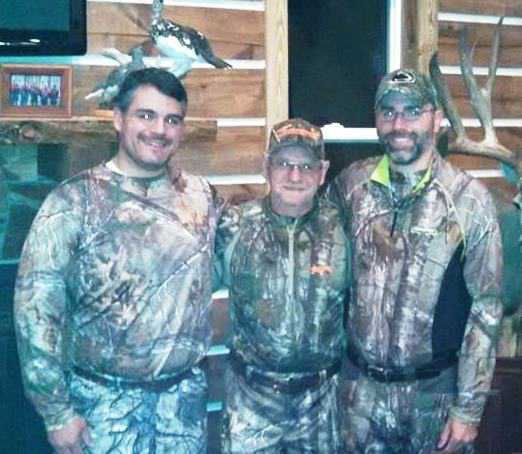 I shared my plan with the family and it was soon determined that our hunt party would be five--me, my dad, my brother, my uncle and my father-in-law. I would be the youngest member of the party at 35 and my dad the oldest. LET'S DO THIS! After talking extensively to Remi Warren at Montana OutWest we had a good idea of what we had to do to prepare. We quickly learned that we were not ready from a physical standpoint to hunt the west. We hit the trail and the gym to get elk fit. We hit the range to stretch our shooting out past the usual 100 yard shots of our Eastern hunting properties. My brother sold plasma to save enough money for the trip. 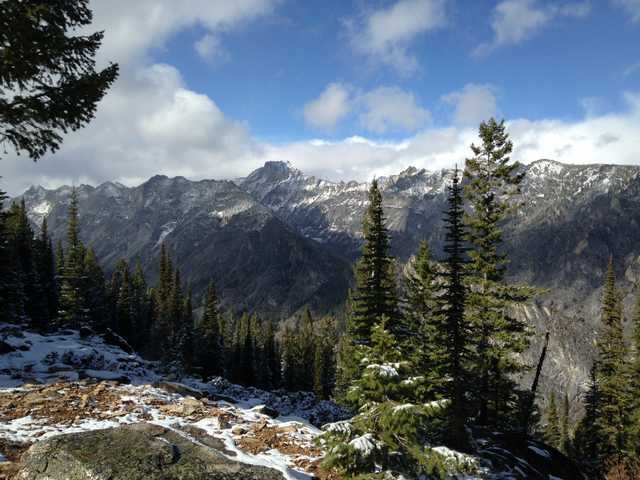 We bought the clothing and gear that we would need in the higher elevations and changing weather of Montana. We mapped out our route as we would be driving so that we could bring all of that meat home. After three years of planning and anticipation and anxiety we hit the road. 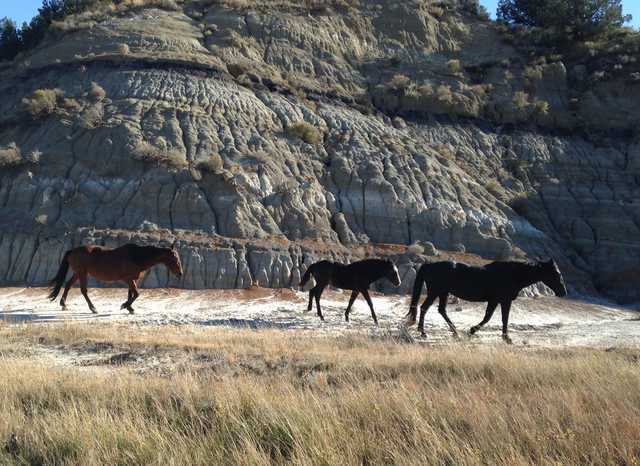 (No we did not take horses...these wild horses were one of the sights from our trip as we made a stop at Theodore Roosevelt National Park in North Dakota.) I left Northern Virginia, picked up my dad in Northwestern Pennsylvania, and my father-in-law in Northeast Ohio. My uncle also drove and he left from Northwestern PA to pick up my brother in Bloomington, Indiana. We would meet back up in Hamilton, Montana. Since we got to Montana a day or two early we thought it would be a good idea to stretch our legs and get some hiking and climbing in. This is beautiful country. 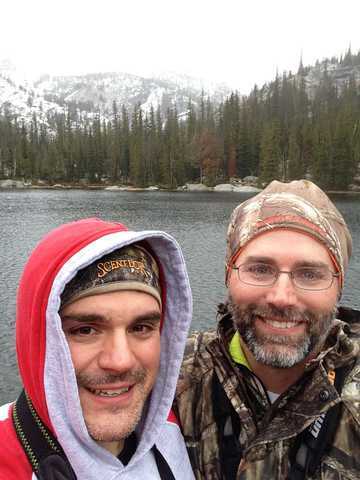 Just a little selfie with my brother Budd at Baker Lake in the Bitterroot National Forest. Checked in at the lodge and we could barely contain ourselves. The weather forecast was not the best, but we were ready to roll with anything. We went outside to get some quick shooting in and show the guides what we could do. Leading up to the trip we practiced as much long range shooting as we could. Ranges in our area beyond 200 yards are hard to come by so my dad cleared some area for us to shoot out to 400. At the outfitter I banged the plate at 500 yards on my first shot--I was ready. 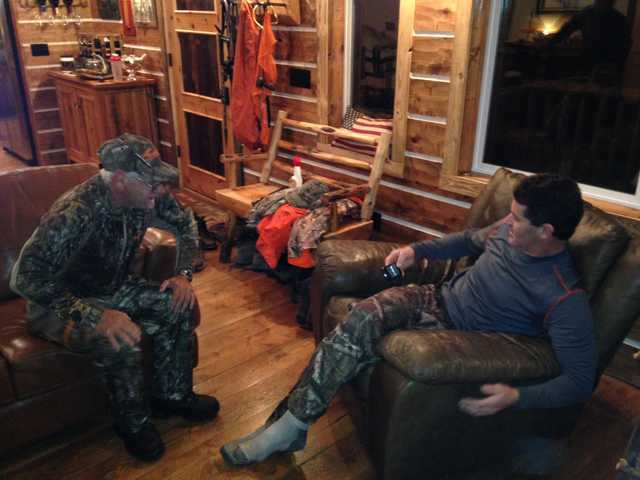 After discussing the next morning with the guides we decided that My dad and father-in-law would go with Remi Warren, the owner of the outfitter, and chase some known elk haunts in the timber. My brother Budd and uncle Fred would go with Jason Warren after a herd they spotted with multiple bulls. I would be with Bart Schmidthuber chasing a single bull in herd spotted not far from the lodge. I was going to be a 1 on 1 hunter because I was the one responsible for all of the planning and I also paid the extra amount. I almost gave this spot to my dad, but he would have told me to take it anyway. This area of the Bitterroot is amazing. The wildlife we saw and the views were unreal. The hunting was an entirely new experience for us. 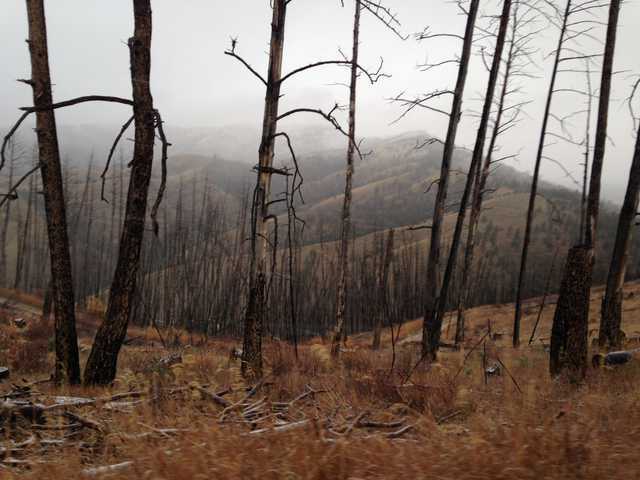 The whole area burned a decade ago leaving us the opportunity to spot vast amounts of country in search of elk and deer. I highly recommend getting yourself to the Bitterroot Valley at some point in the near future. In the dark of opening morning we crossed some deadfalls and hiked in on old fire roads to get set up to find the heard as dawn broke. 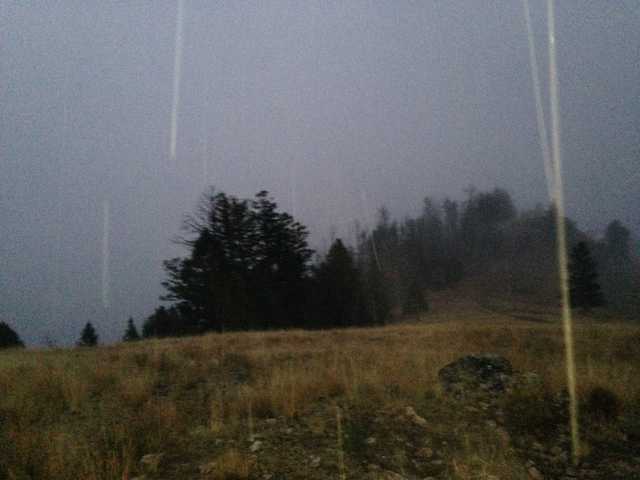 Before first light--I heard it--the first elk bugle I have ever heard. My bull was close all we had to do was find it. I spotted the heard at 900 yards and we quickly found the bull, but there was a problem...between us and them was at least one other hunter. We had to close the distance or risk losing the opportunity. We edged down the mountain and got to within 750 yards when the heard suddenly started moving, very quickly, away from us. Moments later we saw the hunter come around the mountain, apparently oblivious that he had just spooked a herd of elk. We started to move to see if we could see where they went when we found another pair of hunters working up the other side doing the same thing. This is public hunting. The herd had been out in the open the night before and there were at least two other groups pursuing my bull because they had spotted them previously. We had to move. We hustled down the mountain and got back to the truck. Bart knew the area like the back of his hand and knew where they would go. As we took the next forest road we saw the herd cresting a mountain with multiple hunters in pursuit. 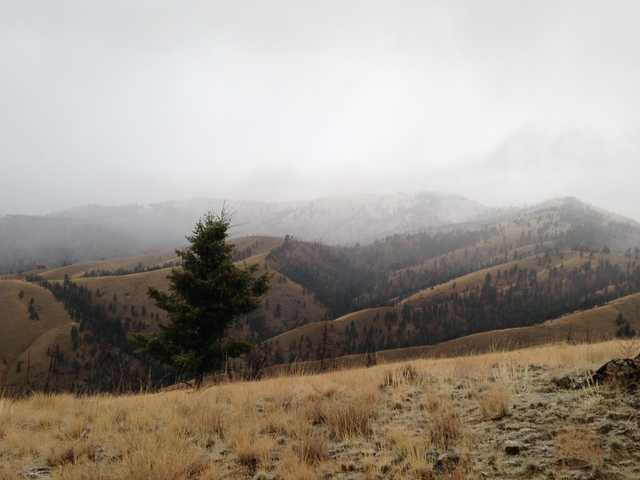 On the other side of the mountain lay private land--if the elk got there we were done. Bart took the curves faster than was exactly safe. We rounded the peak, threw it in park and started running up the peak to head them off. My time at the gym paid off as I was actually able to accomplish this. Suddenly at 50 yards all I see are heads and hooves flying through the timber. We had turned them away from the private land. Cow. Cow. Cow. Cow. ANTLERS! and he was gone. We ran back down the mountain, jumped in the truck and took off. We found where they crossed the road and then right beside me was a spike bull. I yelled for Bart to stop and we jumped out to see if we could see the rest of the heard. We spotted them working up the other side of the valley. They were too far. I had practiced at 400 yards. Had shot ONCE at a target at 500 yards. But it was now or never. I got settled, found the line of cows moving up the mountain. Found a clearing and waited. There he was, 642 yards, I held over his back and let my .7mm bark. He tumbled on the first shot. 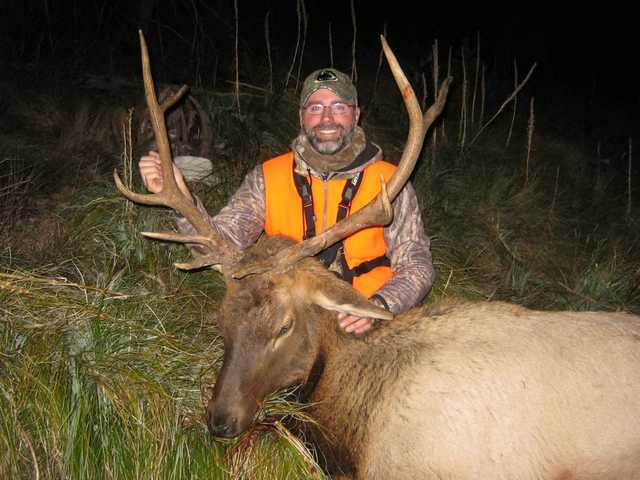 The night before the guides had advised that most of the elk they lose are "dead elk" meaning that they were shot and hunters believed them dead, but they were still able to go a long way. They said keep shooting until they stop moving. So that is what I did. I racked another bullet and let it fly. And another. When I stopped Bart said I smoked him with the first shot and did not need to keep shooting. I did it. After all of the planning and preparation I could see my elk piled up on the next mountain side. Dead at over 600 yards on the first day of the hunt. I knew this was going to be a special week and could not wait to see what everyone else did that day. We made our way to the animal and I rejoiced. It was not a long pack out because we could access a nearby forest road. We got the elk to the processor and tried to decide what to do now. Should we try to go spot for the others who we had not heard from? Should we try to find a mule deer to fill my other tag? We decided on the latter. Now my brother has always considered me to be the lucky hunter of our group. He was sometimes quite bitter about it in fact. Well at least this time I have to agree with him. After driving a few roads, we spotted this buck not far ahead. A few minutes later he was down and I had harvested my first ever mule deer buck. A trophy in my book. And just like that I was tagged out on the first day of the hunt. I still had a wolf tag in my pocket, but the chances of spotting one are long. I had it simply for the chance of stumbling upon one. The smile on my face says it all. We make our way back to the processor for the second time that day. Back at camp that night we learn that I was the only successful hunter of the first day. Stories of the day were told--including several missed shots by my brother and uncle--and a great dinner was prepared. Tip for my brother: if you have a scope with a ballistic compensating reticle, make sure you remember how to use it properly! My dad told us of all of the elk sign they were seeing, but they did not see an animal. The mood was subdued and I was a bit disappointed that I could not revel in my success of the day. Everyone was beat and tired. We had very high hopes and expectation for the first day of the hunt. The outfitter had a long history of high success on day one and we knew it would only get harder moving forward. This was public land and the animals were now pressured. Starting tomorrow it was whole new ballgame. And the weather forecast was not looking good. Day two found my guide and I on high ground hoping to spot elk for the others. Rain and snow cut visibility to zero and our spotting efforts were fruitless. As the rain stopped the fog rolled in and out. We caught glimpses of the valley floor at times but still could not help much with our spotting. Soon we got a call from one of the other guides. After a mostly wasted morning my brother wanted to split up from my uncle and take a look for mulies. We picked him up and headed to our mule deer unit to see what we could find for him. Secretly I think he hoped some of my "luck" would come to him if he was in the truck with me. As we came around a curve in the road, we looked left and spotted something that i did not expect. A pair of wolves! I was in awe. We flew around the next bend in the road trying to find an opening to shoot through. I jumped out and attempted to settle the gun for a shot. I was more nervous for this shot than I had been on the elk. On this mountainside, 340 yards away, I missed a wolf. Bart said I missed high by about 4 inches over his back. Amazingly, in the span of a day and a half I had opportunities on elk, deer and wolf--you could say I like the Bitterroot valley. I knew my brother would be upset. We continued to search for deer the rest of the day. As sunset approached we took the road to the Baker Lake trailhead where we hiked earlier in the week and saw a couple mule deer bucks. We did not see any deer on the way up, but as we came back down the mountain we spotted a group of mulies. We glassed and found the last one was a small buck. My brother steadied his aim and fired. The buck took the hit, stood for a moment and then fell. We finally had another animal down. As the Budd and the guide approached the deer sprang up and charged down the mountain. A couple rushed shots and it was over. The buck was gone. It was dark and we could not find it. My Brother was sick to his stomach. Back at camp we learned that no one else had anything approaching luck that rainy/snowy day, and again the mood was somber as we headed to bed. Day Three dawned with a renewed vigor. The weather improved, we had some snow cover on top of the mountains and the guides divided us up to try and chase some more elk. Bart took my father-in-law who was definitely feeling the rigors of mountain hunting to spend the day glassing and riding instead of hiking. My brother went with my dad and Remi Warren to spend some time with the old man. And my uncle stayed with Jason Warren to try and get back on the herd they missed the first day. I went on my own to try and find my brother's mule deer from the night before and to look for another wolf because hey, I was lucky right? The beauty of this area continues to impress. No luck finding the deer and no wolves so I headed back to the lodge. Got back in time to hear the packer get a call that my uncle connected with a bull. Thank God! It was getting mighty uncomfortable being the only one in camp with an animal down, let alone two. We went to help with the pack out and get uncle Fred's bull to the butcher. Apparently he also shot a spike whitetail buck earlier in the day--he said it got in his way and begged him to shoot him--I say he was feeling the pain of missing on day one, and he had get off the schnide. Either way he was now tagged out and I finally had someone to celebrate with. On the fourth day my Uncle and I found my brother's buck. Amazingly it was less than 50 yards from where we last saw it, but it had gotten itself in a hollow and stayed hidden for a day and a half. The weather kept it cold enough and the animals had stayed away so that my brother was able to harvest most of the deer. Needless to say his spirits were lifted. As a hunter one of the most difficult things we deal with is wounding and losing an animal. More glassing that afternoon and evening, we still had three elk to get and time was running out. 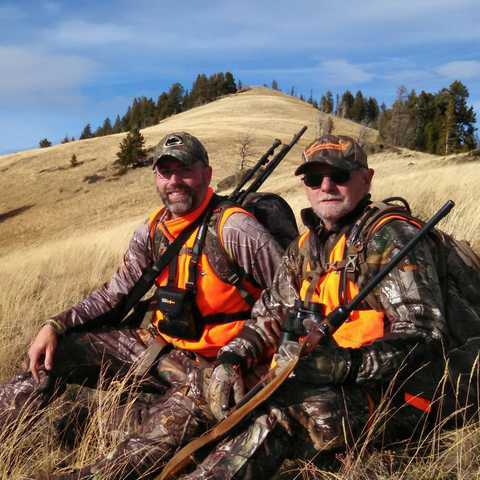 Budd and dad went with Remi Warren to sit a high meadow that evening. Dad had yet to take his scope covers off even though he had probably walked more miles than anyone else so far this week. They say that you have to be extremely fit to hunt elk and that is no lie. My dad may not have been the fastest one on the mountain, but he could walk all day and do it again tomorrow. Boom. Budd connected on the fourth day of the hunt right at last light. 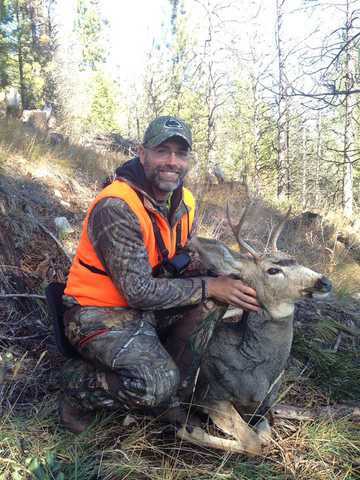 Great day for Budd as he recovered his deer and got his bull. Apparently this was the spot where my dad was going to sit, but he deferred to Budd. 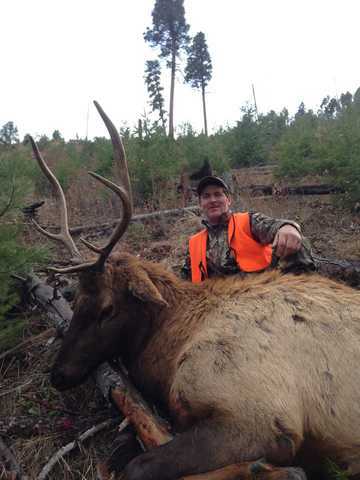 Budd got the elk and dad had one more day to make it happen. Last day of the hunt! The plan today is to sell out on a high meadow opportunity. Dad, the guide, the packer, Uncle Fred and I are all hiking in at daylight to make it up to a meadow where Remi Warren had seen elk the night before. 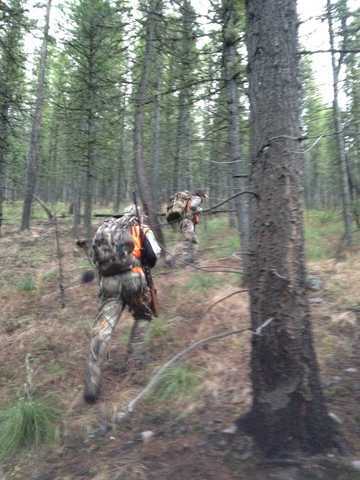 5 hours of hiking and a 3,000 foot climb is what awaited us as we made our push to fill dad's tag. If he is successful, then there will be enough of us to pack it out in one trip. Elk! Walking through the timber on our climb to the meadow and we smelled a bull. Proceeding with caution we followed the tracks and found a herd bedded down. Would this be it? Nothing. Just cows. Apparently the bull we could smell musty have smelled us and quickly vacated the area. 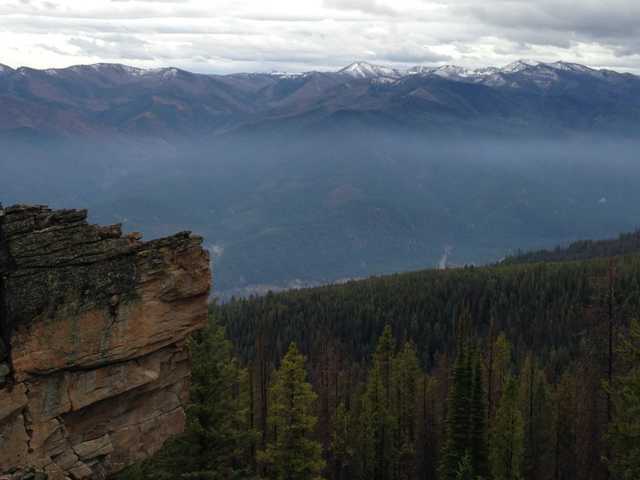 At the peak, sitting on the Continental Divide. That was a bear of a climb. 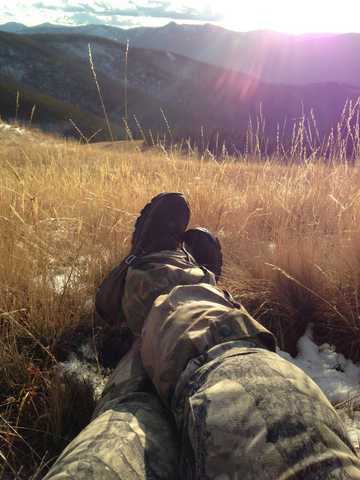 We made it up and now it is a waiting game until the evening when we expect the elk to show in the meadow below us. Spent the afternoon chatting and snoozing by the fire. What a beautiful way to end the week. This place is amazing. Glassing and waiting for that bull for dad. He had also missed a good whitetail the day before. This is our meadow. Last chance to make it happen. And nothing. Four cows came out in the meadow at last light and we watched until it was fully dark just in case a bull was nearby. This hurts. 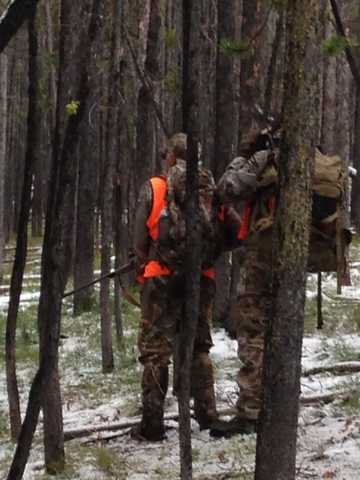 My dad is such a good man, such a good mentor and such a good hunter. He is the only one of us that did not have an opportunity to harvest an animal on what may be his one-and-only opportunity to hunt the west. The trip down the mountain in full dark after an exhausting day is brutal. Spirits are low, we question our choice of outfitter, we doubt our abilities and theirs, we view the day as a total loss and we just want to get back. Three and half hours later we get to the truck and make a silent drive to the lodge. Dinner at 11:00 pm and then to bed. Looking back on the trip, that was just frustration showing at the end. It was in-fact an extremely successful hunt. 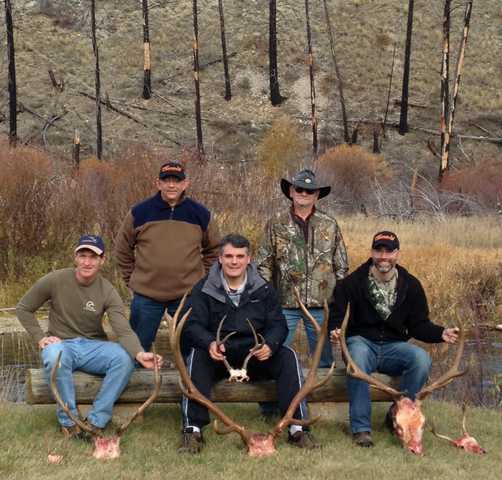 5 hunters took 3 elk and 3 deer on a 5 day hunt in Montana. We filled our trailer with approximately 900 lbs of meat for the over 2,000 mile drive back to Indiana, Pennsylvania and Virginia. I highly recommend our outfitter as the accommodations and food were great and they got us on three bulls. I have questioned myself again and again and I always come to the same conclusion. I would give anything to go back and trade places that first day with my dad so that he could have been the one to get the elk, and I would be the one to go home empty handed. We have vowed to get him back out again. 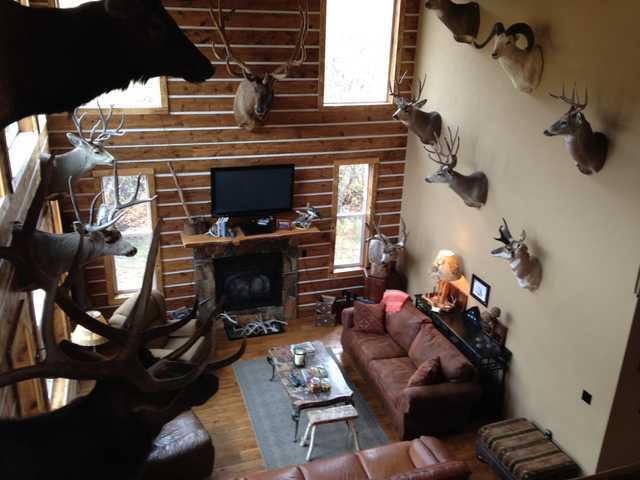 He has a bucket list of animals to hunt with nothing checked off. Years and age are working against us but with any luck--and according to my brother I have plenty--we will get my dad his bull. Josh, how was your trip to MT? Did your Dad get his bull? Thanks Bob, Can't wait to head out there in just over 2 weeks! Josh, great story especially for a long awaited trip with family. Hope your Dad gets his elk on your trip with Rawhide. Roy and the team will do well by you as they did for me and friends last year. Great story and great memories. Thanks for sharing. Great story! I'm all about "family and friends hunting"! 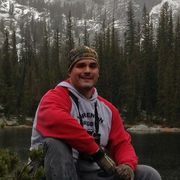 For years I dreamed about a hunting trip out west.........it finally happened in 2009 and a couple of times since then! Each time I was able to go with one and sometimes two of my sons and other friends. The memories of trips like that will always be with you. Josh.....great story ! Nothing better than family time in the mountains.